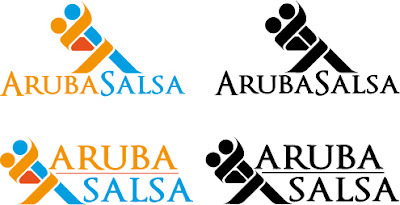 Aruba Salsa a dance school for Salsa in Aruba. This was a small contest before they decide who to hire to make a there house style. Did not won it but still this logo looks pretty good. A pair dancing and the style I made it is a ribbon style, the orange ribbon is wrapped around the blue one. When you look good you see an A and a S in the logo. Left the orange and cyan was the one I submitted because they said they wanted a warm and sunny colors too it. Right the red and black one is the color I prefer more to this logo. It give a more professional feel for this logo and less playful.